﻿Based on the FDNY configuration, this kit offers a top down rescue option for firefighters or civilians who may be stranded at a window during a structure fire. The 100% Technora H3 Tech125 offers the best heat resistance of Sterling's line of Technora ropes and features indicator markings every meter to indicate distance and speed of deployment. 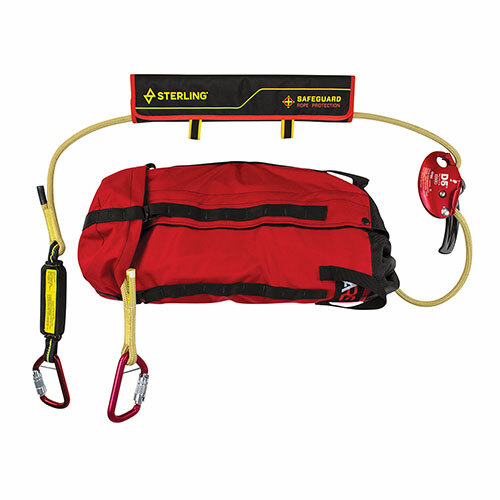 The attachment end features a shock pack to limit impact forces on the rescuer and the anchor. The simple-to-use D5 descender controls one- or two-person loads during a pickoff, and the included chafe guard protects against damage at the parapet. For more information on proper use of this kit, please contact one of our recommended training companies.